These sites reflect historical examination of one of baseball's greatest players and his ensuing philanthropic legacy. Proposition 13 (officially named the People's Initiative to Limit Property Taxation) was an amendment of the Constitution of California enacted during 1978, by means of the initiative process. It was approved by California voters on June 6, 1978. It was declared constitutional by the United States Supreme Court in the case of Nordlinger v. Hahn, 505 U.S. 1 (1992). Proposition 13 is embodied in Article 13A of the Constitution of the State of California. The proposition decreased property taxes by assessing property values at their 1975 value and restricted annual increases of assessed value of real property to an inflation factor, not to exceed 2% per year. It also prohibited reassessment of a new base year value except for (a) change in ownership or (b) completion of new construction. In addition to decreasing property taxes, the initiative also contained language requiring a two-thirds majority in both legislative houses for future increases of any state tax rates or amounts of revenue collected, including income tax rates. It also requires a two-thirds vote majority in local elections for local governments wishing to increase special taxes. Proposition 13 received an enormous amount of publicity, not only in California, but throughout the United States. Passage of the initiative presaged a "taxpayer revolt" throughout the country that is sometimes thought to have contributed to the election of Ronald Reagan to the presidency during 1980. However, of 30 anti-tax ballot measures that year, only 13 passed. A large contributor to Proposition 13 was the sentiment that older Californians should not be priced out of their homes through high taxes. The proposition has been called the "third rail" (meaning "untouchable subject") of California politics, and it is not popular politically for lawmakers to attempt to change it. Proposition 13 drew its impetus from 1971 and 1976 California Supreme Court rulings in Serrano v. Priest,Serrano[›] that a property-tax based finance system for public schools was unconstitutional. 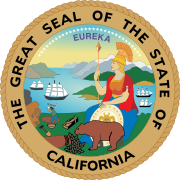 The California Constitution required the legislature to provide a free public school system for each district, and the Fourteenth Amendment of the United States Constitution (which includes the Equal Protection Clause) required that all states provide to all citizens equal protection of the law. The court ruled that the amount of funding going to different districts was disproportionately favoring the wealthy. Previously, local property taxes went directly to the local school system, which minimized state government's involvement in the distribution of revenue. This system also allowed a wealthier district to fund its schools with a lesser tax rate than the rate a less affluent district would have to set to yield the same funding per pupil. The Court ruled that the state had to make the distribution of revenue more equitable. The state legislature responded by capping the rate of local revenue that a school district could receive and distributing excess amounts among the poorer districts. As a result property owners in affluent districts perceived that the benefits of the taxes they paid were no longer enjoyed exclusively by the local schools. Moreover, the state's increasing population resulted in increased demand for housing, resulting in greater residential property values and, consequently, greater taxes for residences. Many older Californians with fixed incomes had difficulty paying increasing property taxes. Due to severe inflation during the 1970s as a result of the 1973–75 recession, reassessments of residential property increased property taxes so much that some retired people could no longer afford to remain in homes they had purchased long before. Government spending had also increased dramatically during the years prior to 1978. Between 1973 and 1977, California state and local government expenditures per $1000 of personal income were 8.2 percent higher than the national norm. From 1949 to 1979, public sector employment in California outstripped employment growth in the private sector. By 1978, 14.7 percent of California's civilian work force was state and local government employees, almost double the proportion of the early 1950s. During the early 1960s, there were several scandals in California involving county assessors. These assessors, who had traditionally enjoyed great latitude in setting the taxable value of properties, were found rewarding friends and allies with artificially low assessments, with tax bills to match. These scandals resulted in the passage of law AB 80 during 1966, which imposed standards for assessments to represent market value. However, assessors, who are elected officials, had traditionally used their flexibility to aid elderly homeowners on fixed incomes, and more generally to systematically undervalue vote-rich residential properties and compensate by inflating commercial assessments. The use of market value as a result of AB 80 could easily represent a mid-double-digit percentage increase of assessment for many homeowners. As a result of all these factors, a large number of California homeowners experienced an immediate and drastic increase of valuation during the 1970s, which was simultaneously matched with increasing tax rates on that assessed value, only to be informed that the taxed monies would be redistributed to distant communities. Howard Jarvis, a former newspaperman and appliance manufacturer, became a taxpayer activist after his retirement, and began a campaign to reduce property taxes. Howard Jarvis and Paul Gann were the most vocal and visible advocates of Proposition 13. Officially named the "People's Initiative to Limit Property Taxation," and known popularly as the "Jarvis-Gann Amendment," Proposition 13 was listed on the ballot through the California ballot initiative process, a provision of the California constitution which allows a proposed law or constitutional amendment to be offered to voters if advocates collect a sufficient number of signatures on a petition. Proposition 13 passed with almost 65% of those who voted in favor and with the participation of nearly 70% of registered voters. After passage, it became article 13A of the California state constitution. By Proposition 13, the annual real estate tax on a parcel of property is limited to 1% of its assessed value. This "assessed value," may be increased only by a maximum of 2% per year, until and unless the property has a change in ownership. At the time of the change in ownership the low assessed value may be reassessed to complete current market value which will produce a new base year value for the property, but future assessments are likewise restricted to the 2% annual maximum increase of the new base year value. If the property's market value increases rapidly (values of many detached dwellings in California appreciated at annual rates averaging more than 10% in the decade ending with 2005)  or if inflation exceeds 2%, the differential between the owner's taxes and the taxes a new owner would have to pay can become quite large. The property may be reassessed under certain conditions other than a change of ownership, such as when additions or new construction occur. The assessed value is also subject to reduction if the market value of the property declines below its assessed value, for example, during a real estate slump. Reductions of property valuation were not provided for by Proposition 13 itself, but were made possible by the passage of Proposition 8 (SCA No. 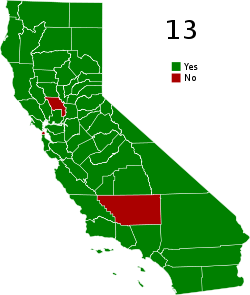 67) during 1978 which amended Proposition 13. Such a real estate slump and downward reassessments occurred during 2009 when the State Board of Equalization announced an estimated reduction of property tax base year values due to negative inflation. Property tax in California is an Ad valorem tax meaning that the tax assessed (generally) increases and decreases with the value of the property. Advocates argue that Proposition 13 has provided predictability for property owners, and increased community stability. They argue that, while progressive income tax structures affect higher incomes, property taxes take a higher percentage of lower incomes, for those people who own a highly valued property but have lower incomes. It is pointed out that state income tax and sales tax were started during the Great Depression, when taxpayer resistance began due to property taxes that unemployed workers could not pay. According to the Center for Governmental Analysis, between fiscal years 2000 and 2005 property tax revenue has increased 22.11%, while personal income per capita has increased 13.80% and general per capita revenue 21.93%. Estimates are that Proposition 13 has saved California taxpaying citizens over $528 billion (value retrieved 5/31/2009). However, other groups, such as the California Taxpayers Association, citing "The Future of Proposition 13 in California," California Policy Seminar, March 1993, University of California, authored by Arthur O’Sullivan, Terri A. Sexton, and Steven M. Sheffrin, argue that the tax is in fact progressive, and that acquisition-value assessments seem to provide property tax equity. Advocates of Proposition 13 argue that the restriction of tax increases for previously owned property has decreased the volatility of funding for municipalities. They claim that pre-Proposition 13 property tax revenue was almost three times as volatile. During 2009, the State Board of Equalization noted that only five times since the passage of Proposition 13 was the annual increase less than the permitted 2%, and that the estimated adjustment for 2010 would be negative, for the first time since the passage of Proposition 13. David Doerr argues that the "acquisition value system" acts as a control to overspending due to high real estate values, while permitting a source of revenue growth in times of recession. Local governments would then have to decrease spending more severely when the housing market decreased. According to the California Building Industry Association, construction of a median priced house results in a slight positive fiscal impact, as opposed to the position that housing does not "pay its own way". The trade association argues that this is because new homes are assessed at the value when they are first sold. Additionally, due to the higher cost of new homes, the trade association claims that new residents are more affluent and may provide more sales tax revenues and use less social services of the host community. Proposition 13 remains popular among Californian likely voters, who are mostly homeowners. Among likely voters, 53% described Prop 13 as "mostly a good thing" while 33% responded that it was "mostly a bad thing" in a 2006 Public Policy Institute of California survey. For adults who are not likely voters (mostly renters), Prop 13 was unpopular—- only 29% approval to 47% disapproval. Among California adults, overall approval was 47% approval to 38% disapproval. Periodic newspaper accounts report high voter approval. Others argue that the real reason for the claimed negative effects is lack of trust for elected officials to spend their money wisely. Business improvement districts are one means where property owners have chosen to tax themselves for additional government services. Property owners find that these targeted taxes are more palatable than general taxes. Any changes to Proposition 13 would need to take into account potential impacts on 400+ (2008 figure) local redevelopment agencies across California. As of June 30, 2008, the total assessed valuation of land in redevelopment project areas was over $674 billion and combined revenues for FY 2007–2008 were over $10 billion. Changes to Proposition 13 may result in an unintended windfall in tax increment revenue for local redevelopment agencies which are restricted severely by state law on how they may use the funds. Redevelopment agency revenue in California is kept separate from cities' general funds, which are used to pay for basic services such as fire, police, parks, streets and so on. Community redevelopment law in California is based on the controversial Tax increment financing mechanism. As an example, in Alameda County, California, 12.24% of assessed property value, or $24.5 billion worth, is subject to redevelopment tax increment, and in Fiscal Year 2007–08, $232 million of property taxes went to local redevelopment agencies instead of to the county or city general funds. Of property tax receipts in Alameda County, 13 cents of every property tax dollar goes to local redevelopment agencies, 18 cents goes to cities, 13 cents goes to special districts, 15 cents goes to the county, and 41 cents goes to local schools. In Contra Costa County, Schools get 48%, Special Districts get 19%, the County gets 13%, Redevelopment Agencies get 12%, and Cities get 8%. Moreover, some believe that because homeowners would allegedly keep their homes for longer, young households often rent for longer before buying a house. Because Proposition 13 could be a disincentive to sell, there is less turnover among owners near the older downtown areas, and prices appreciate fastest in these areas. However, Proposition 13 is not the only factor working on California's housing market to create these conditions: as it grows, fewer places available to build new housing result in greater prices for existing housing. Because of geographical limits and enacted environmental and growth legislation from cities and counties, new development is increasingly expensive. California also has high rates of migrants from other countries and a high birth rate, which has contributed to more demand for housing, and it has low amounts of moderately priced housing due to the increased property tax liability after a sale. In effect, because the different tax treatment makes real estate more valuable to the current owner than to any potential buyer, selling it makes no economic sense. This same policy has had a higher effect on migrants and African-Americans than whites, with both groups staying longer in their homes or renting for longer than whites. Local governments now use imaginative strategies to maintain or increase revenue due to Proposition 13 and the state's attendant loss of property tax revenue (which formerly went to cities and counties). Most California localities have recently sought their voters' approval for special assessments such as Mello-Roos that would levy new taxes and fees for services that used to be paid for entirely or partially from property taxes: streets, water, sewer, electricity, infrastructure, schools, parks, police protection, firefighting units, and penitentiary facilities. Sales tax rates have increased from 6% (pre-Prop 13 level) to 8.25% and more. Proposition 13 disproportionately affects coastal metropolitan areas, such as Los Angeles and the Bay Area, where housing prices are higher, relative to inland communities with lower housing prices. According to the National Bureau of Economic Research, more research would show whether benefits of Proposition 13 outweigh the redistribution of tax base and overall cost in lost tax revenue. Cities and localities have become more dependent on state funds, which has increased state power over local towns and cities. The state provides "block grants" to cities to provide services, and bought out some facilities that locally administer state-mandated programs. Local governments have become more dependent on sales taxes for funds, which some maintain has resulted in poor land planning, and has made cities encourage more retail stores and "big box" outlets. The jobs and ongoing sales tax those stores provide may discourage growth of other sectors and job types that may provide better opportunities for residents. Additionally, cities have decreased services and increased fees to compensate for the shortfall, with particularly high fees levied on developers creating new houses or industrial outlets. These costs transfer to the building's buyer, who may be unaware of the thousands in fees included with the building's cost. California public schools, which during the 1960s had been ranked nationally as among the best, have decreased to 48th in many surveys of student achievement. Some  have disputed the attribution of the decline to Proposition 13's role in the change to state financing of public schools, because schools financed mostly by property taxes were declared unconstitutional (the variances in funding between lower and higher income areas being deemed to violate the equal protection clause) in Serrano vs. Priest, and Proposition 13 was then passed partially as a result of that case. California's spending per pupil was the same as the national average until about 1985, when it began decreasing, which resulted in another referendum, Proposition 98, that requires a certain percentage of the state's budget to be directed towards education. Public libraries have seen a decrease of funding from cities. Police departments received generally the same amount of funding, from 15% in 1978 to 16% during 1995. Cities also decreased water, gas and electricity expenses. The U.S. Supreme Court declared in Nordlinger v. Hahn that Proposition 13 was constitutional. Justice Harry Blackmun, writing the majority opinion, noted that the state had a "legitimate interest in local neighborhood preservation, continuity, and stability", and that it was acceptable to treat owners who have invested for some time in property differently from new owners. If one objected to the rules, they could choose not to buy. In the 2003 California recall election in which Arnold Schwarzenegger was elected governor, his advisor Warren Buffett suggested that Proposition 13 be repealed or changed as a method of balancing the state's budget. Schwarzenegger, believing that such an act would be inadvisable politically and could end his gubernatorial career, said, "I told Warren that if he mentions Proposition 13 again he has to do 500 sit-ups." On November 7, 2000, voters in the state approved Proposition 39, which lowered proposition 13's super-majority for local school bond passage from the original 2/3 super-majority, to a 55 percent super-majority. Proposition 2½, the Massachusetts version of Proposition 13, passed in 1980. Oregon Ballot Measure 5 (1990), property tax cap in Oregon. Facilities Act of 1982 or simply Mello-Roos passed in 1982. California Proposition 218 (1996), which requires a two-thirds votes for other property related fees. ^ a b Tugend, Alina (May 7, 2006). "The Least Affordable Place to Live? Try Salinas". New York Times. http://www.nytimes.com/2006/05/07/realestate/07california.html?ex=1182830400&en=3831f57bb981c487&ei=5070m. Retrieved April 28, 2010. ^ "Who’s Afraid of the Big Bad Initiative?". Hoover Institute. http://www.hoover.org/publications/digest/3491516.html. ^ a b c d e f g h i "Senator Peace: Cure Prop. 13 'Sickness' by Reassessing Commercial Property, Boosting the Homeowners' Exemption and Cutting the Sales Tax". Cal Tax Digest. http://www.caltax.org/MEMBER/digest/feb2000/feb00-4.htm. ^ "California Home Prices Appreciation Rates". http://www.forecast-chart.com/home-prices-california.html. Retrieved December 9, 2009. ^ "U.S. Department Of Labor Bureau of Labor Statistics, Consumer Price Index". ftp://ftp.bls.gov/pub/special.requests/cpi/cpiai.txt. ^ "California Consumer Price Index". http://www.dir.ca.gov/dlsr/CAPriceIndex.htm. Retrieved 12-09-09. ^ a b "State Board of Equalization Statement On Negative Inflation Factor for Annual Proposition 13 Adjustment". California State Board of Equalization. http://www.boe.ca.gov/news/2009/119-09-Y.pdf. Retrieved December 9, 2009. ^ Said, Carolyn (June 21, 2009). "Lower home values mean lower tax revenue". San Francisco Chronicle. http://www.sfgate.com/cgi-bin/article.cgi?f=/c/a/2009/06/21/MN99188I94.DTL. Retrieved December 9, 2009. ^ a b "Proposition 13: Love it or Hate it, its Roots Go Deep". http://www.caltax.org/research/prop13/prop13.htm. Retrieved December 9, 2009. ^ California's Tax Machine, California Taxpayers Association, 2000. ^ Lochhead, Carolyn (August 16, 2003). "Prop. 13 remains controversial after a quarter of a century / ECONOMICS: / Budget woes fuel opposition to tax measure". The San Francisco Chronicle. http://www.sfgate.com/cgi-bin/article.cgi?file=/chronicle/archive/2003/08/16/MN294575.DTL. ^ Said, Carolyn (January 25, 2009). "Property tax revenue plummets with home values". San Francisco Chronicle. http://www.sfgate.com/cgi-bin/article.cgi?f=/c/a/2009/01/24/MNV7155VSC.DTL. Retrieved December 9, 2009. ^ a b c d Picker, Les. "The Lock-in Effect of California's Proposition 13". National Bureau of Economic Research. http://www.nber.org/digest/apr05/w11108.html. ^ a b c d e f g h Chapman, Jeffrey I.. "Proposition 13: Some Unintended Consequences" (PDF). Public Policy Institute of California. http://www.ppic.org/content/pubs/op/OP_998JCOP.pdf. ^ "Ultimate Test: Who Is Accountable for Education If Everybody Fails?". Rand Institute. http://www.rand.org/publications/randreview/issues/spring2005/ulttest.html. ^ "The Merrow Report: Serrano V. Priest". http://www.pbs.org/merrow/tv/ftw/serrano.html. Smith, Daniel A. (1998). Tax Crusaders and the Politics of Direct Democracy. New York: Routledge. ISBN 0415919916. Nancy Marmer, "Proposition 13: Hard Times for the Arts," Art in America, September/October 1978, pp. 92–94. Martin, Isaac William. The Permanent Tax Revolt. Stanford University Press, 2008. O’Sullivan, Arthur, Terri A. Sexton and Steven M. Sheffrin, Property Taxes and Tax Revolts: The Legacy of Proposition 13, Cambridge Press, 1995. Paperback reissued 2007. Sexton, Terry A. and Steven M. Sheffrin, Proposition 13 in Recession and Recovery, Public Policy Institute of California, 1998. Sheffrin, Steven, "Re-Thinking the Fairness of Proposition 13," in Jack Citrin, ed., Proposition 13 at 30, Berkeley, CA: Berkeley Public Policy Press, 2009. This page was last modified on 8 July 2011 at 13:45.